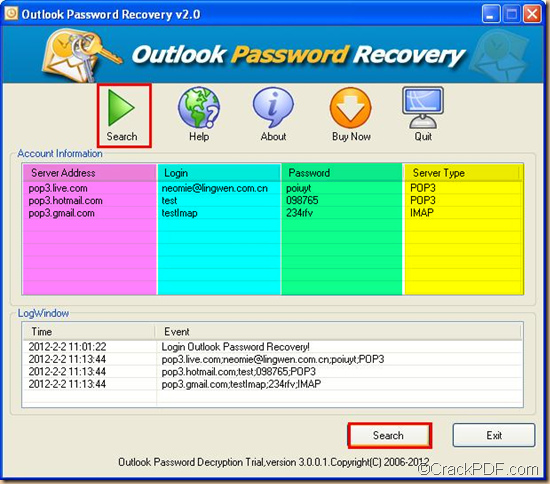 The Windows application CrackPDF Outlook Password Recovery supports to retrieve MS Outlook password in an easy way. 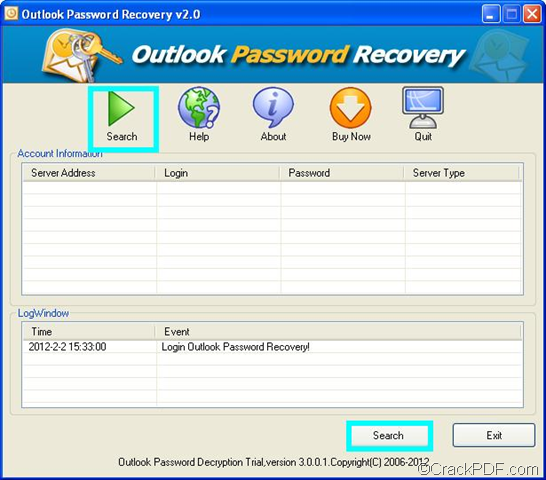 CrackPDF Outlook Password Recovery is an easy-to-use application that can help you retrieve password, email account name, server address, and server name for all versions of MS Outlook such as Outlook 1997, 2000, 2003, 2007, and 2010 email accounts. In this article, you will see how to use this application to retrieve Outlook password with easy operations. 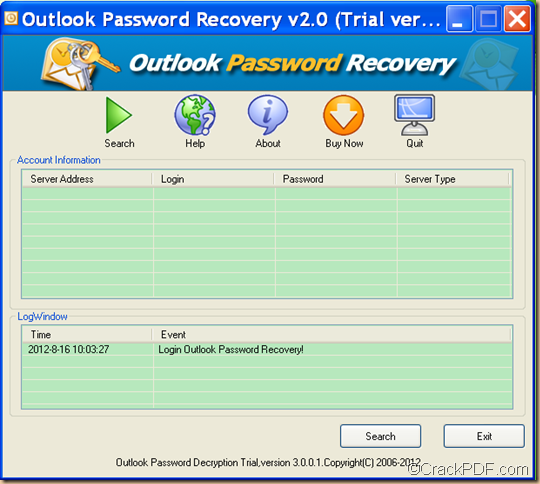 At first, please download the package of CrackPDF Outlook Password Recovery. Then, please follow the steps below to retrieve the Outlook password. After downloading the package of the application, please double click the installer and follow the setup wizard to install it on the computer. Then, the application will run. You can see the interface like the following snapshot. To start the retrieval of the Outlook password, you just need to click the Search button in the tool bar or click the Search button at bottom of the interface. Several seconds later, you can see all the useful information of the email accounts such as the server addresses, email account names, server type and the retrieved password in the “Account Information” table list. You can also see the start time and finish time of the process and event in the “LogWindow” table list. Kind Reminder: If you use the trial version of this application to retrieve Outlook passwords, account names, etc., you may not see the full passwords. And you can only use the trial version for 20 times. 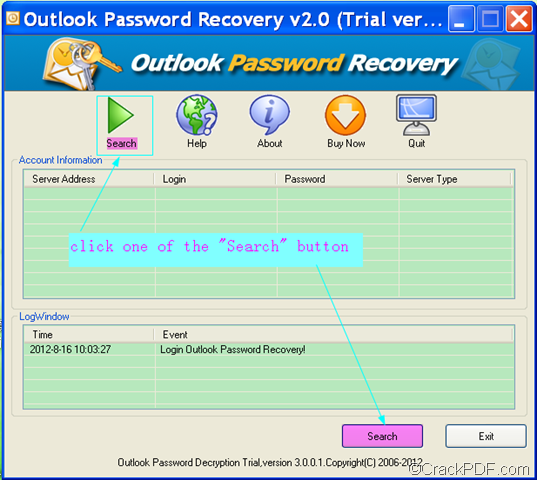 In the end of this article, if you are interested in CrackPDF Outlook Password Recovery, please click the following button to download the free trial version of this application. Just have a try and you will love it. How to retrieve Outlook email password and Outlook server name? If you cannot log in Microsoft Outlook email because you forgot the Outlook email password, you can try CrackPDF Outlook Password Recovery. 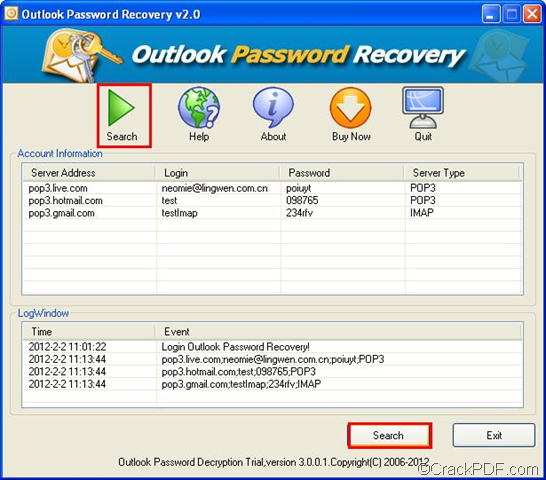 This article will discuss about how to use this practical password recovery tool to retrieve password and server name for Outlook email account. 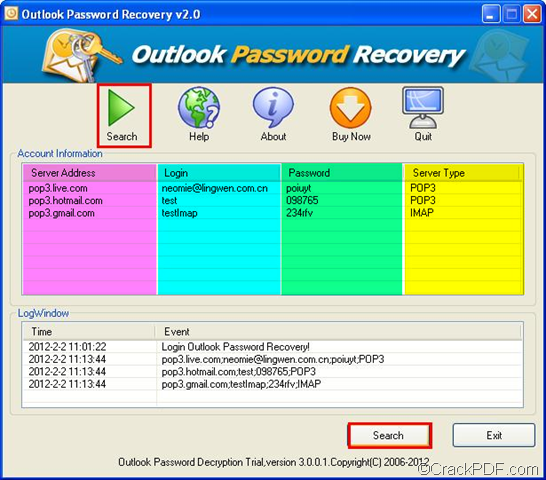 CrackPDF Outlook Password Recovery stands out among the data recovery applications because it can recover password, login name, server address, and server name for Outlook email in just one click of mouse with fast recovery speed. 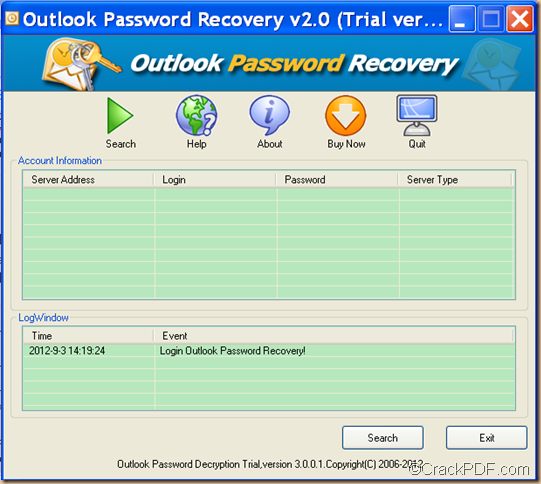 Then, how to restore Outlook email data information like account password, name, etc. with CrackPDF Outlook Password Recovery? Firstly, you need to download CrackPDF Outlook Password Recovery. Then, you need to find the .exe file file in the download package and double click the file, and follow the setup wizard to install it on your computer. The software will automatically run by default. 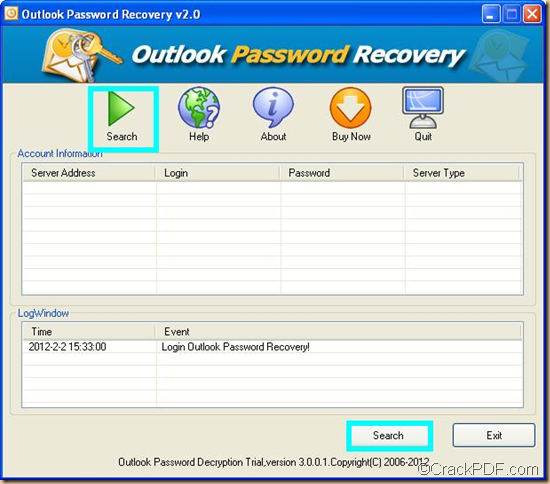 Lastly, you need to click Search button on the interface of CrackPDF Outlook Password Recovery. On the interface, you can see two “Search” buttons. You can choose either of them. As soon as you click the Search button, the application will instantly find back the Outlook data such as email password, account name, server name and address for you. 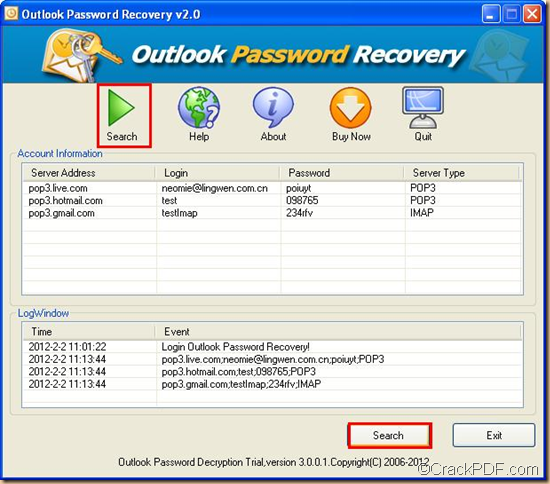 Instantly, with an amazing speed, CrackPDF Outlook Password Recovery will display password, login name, server address, and server name in the “Account Information” list. So easy and fast,right? 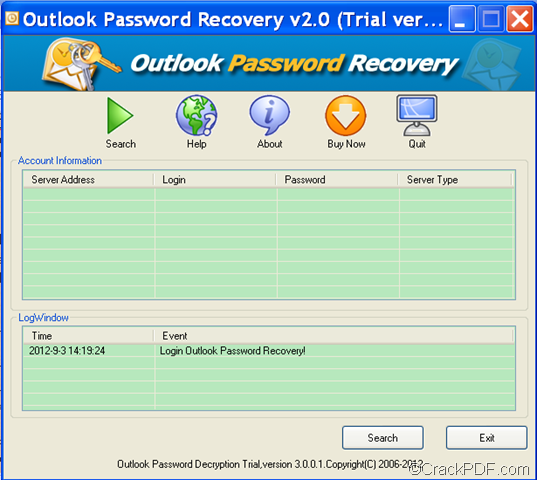 Free trail of CrackPDF Outlook Password Recovery is available. 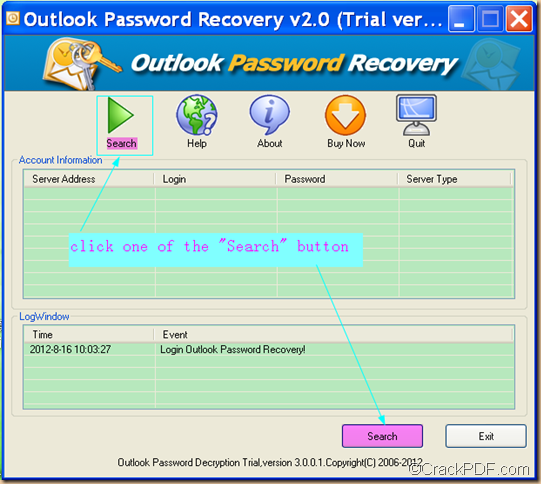 You can try it to recover the forgotten Outlook password in just one click. Kind Reminder: The trial version of CrackPDF Outlook Password Recovery will only display the first or the last elements in the password and can only be used for 20 times. To eliminate these limitations, please buy the full version of CrackPDF Outlook Password Recovery.